Seoul(web team): Prime Minister Narendra Modi on Tuesday sought unity among Asian countries and said they must work as Asians to shape the world and reform the global institutions of governance, including the United Nations. "Asia of unity will shape the world," Modi said, adding that India seeks an Asia of shared prosperity, where the success of one nation becomes the strength of the other. President Park: Modinomics and Korea's 3.0 economic plan can combine to become central drivers for lifting the global economy. We must work as Asians to reform the global institutions of governance, including the United Nations and its Security Council. 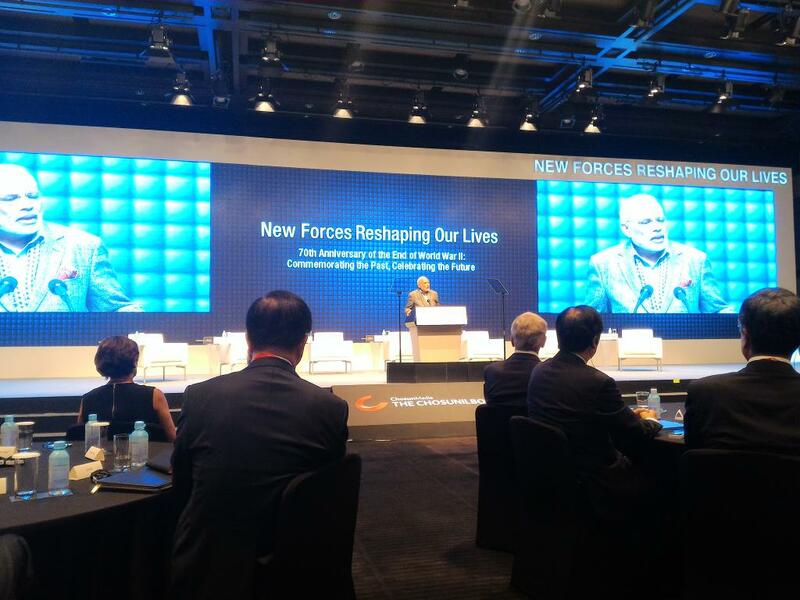 India seeks an Asia of shared prosperity, where the success of one nation becomes the strength of the other. The future I dream for India is the future I seek for our neighbours. Our growth must be more inclusive within and across nations'. If Asia must rise as one, Asia should no longer think of itself in regional fragments. Reverence for nature is part of our shared heritage. Combating climate change is in our enlightened self interest. As some of us in Asia become more prosperous we must be prepared to share our resources and markets with those who need them. Growth must be more inclusive within & across nations. This is the obligation of national governments but also a regional responsibility. Korea's economic miracle and global leadership in technology has made the promise of the Asian Century more real. It is a great honour to share the stage with President Park and Sheikha Mozah. The visit to Korea has just begun but it is already very productive. We will also establish a channel – Korea Plus – to facilitate their investment and operations in India. President Park & I see vast opportunities for Korean companies to participate in our ‘Make in India’ Mission. 7 Bilateral Agreements signed in areas ranging from taxation to transport. 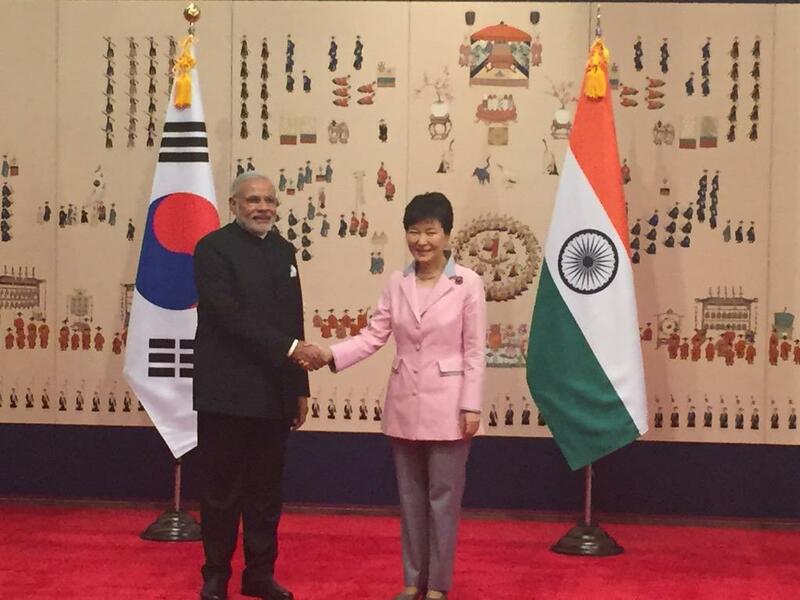 PM Modi and President Park Geun-hye meet in Seoul. Development is not about big roads & buildings. It's about a change in quality of life. For instance,I want every home to have a toilet. The path is tough but we have embraced that path. The solution to all problems is development. Today people are excited to come to India. This is the mood that has changed. And after all, the people make the Nation. In the last one year the world's perception about India has changed. India is being seen as the fastest growing economy of the world. I am starting my visit to Korea by meeting all of you. PM Modi pays his tributes. Modi will address a community reception where about 1,500 members of the Indian community are expected to attend before getting into talks with the Korean President. 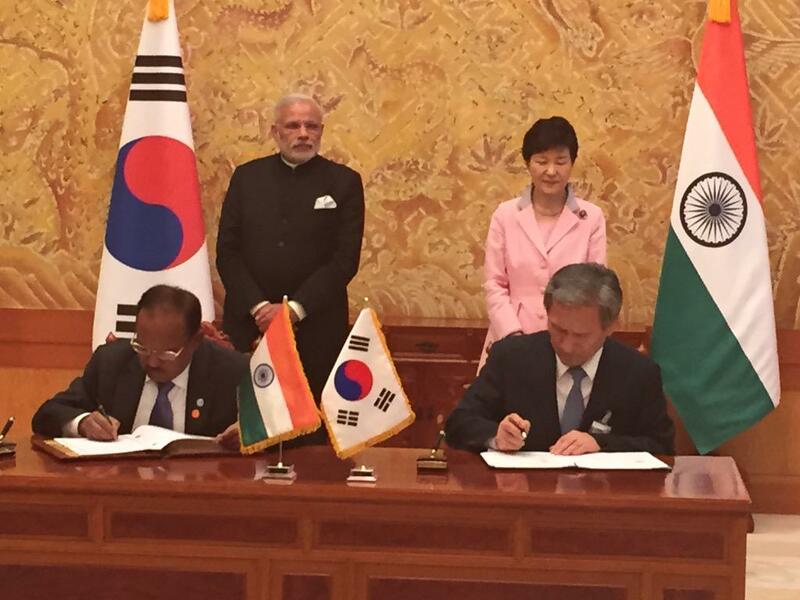 PM @narendramodi and President Park Geun-hye witness signing of agreements in Seoul. 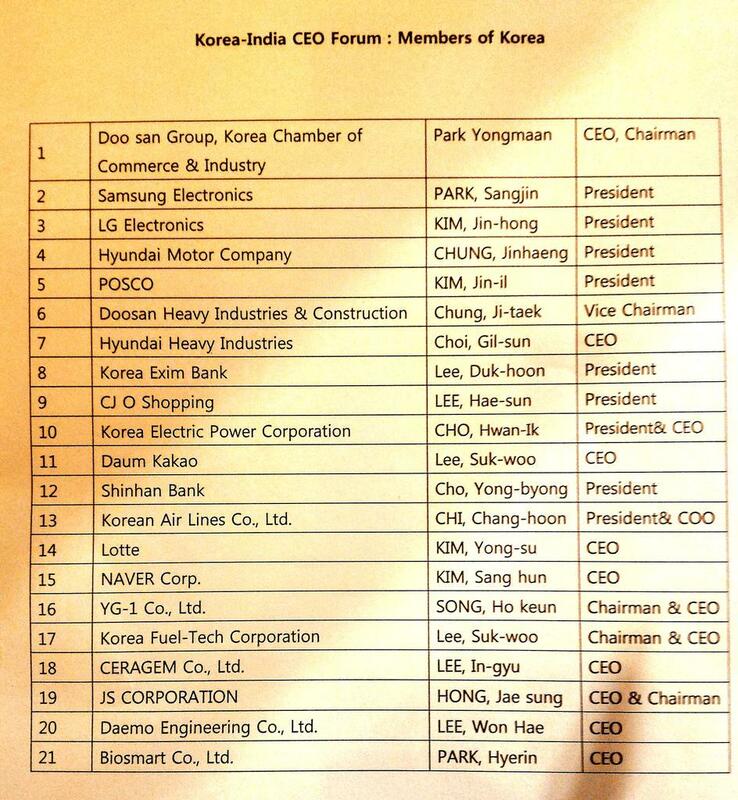 Modi, who is keen to woo Korean investments in India, will address India-Republic of Korea CEOs Forum, which would also be attended by the Korean President. 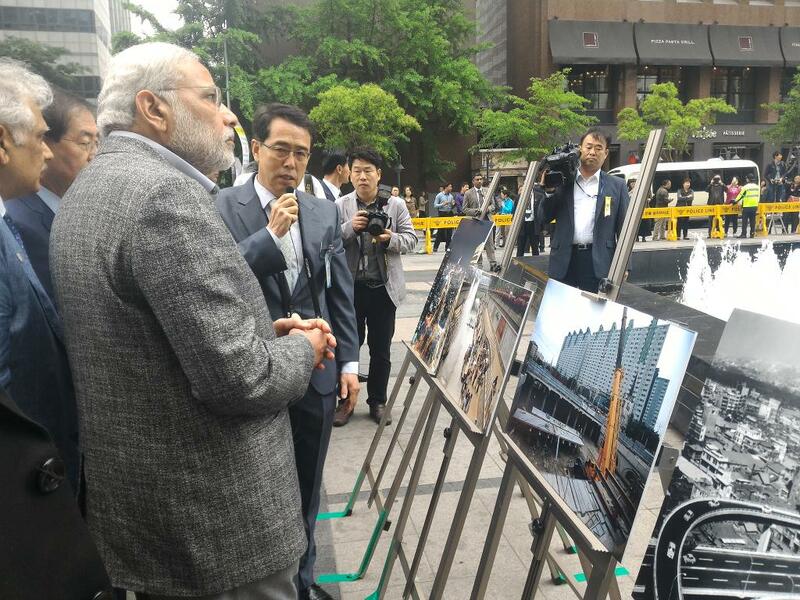 Modi will also visit the Hyundai Heavy Industries shipyard in the backdrop of shipbuilding emerging as an important area of cooperation between the two countries. 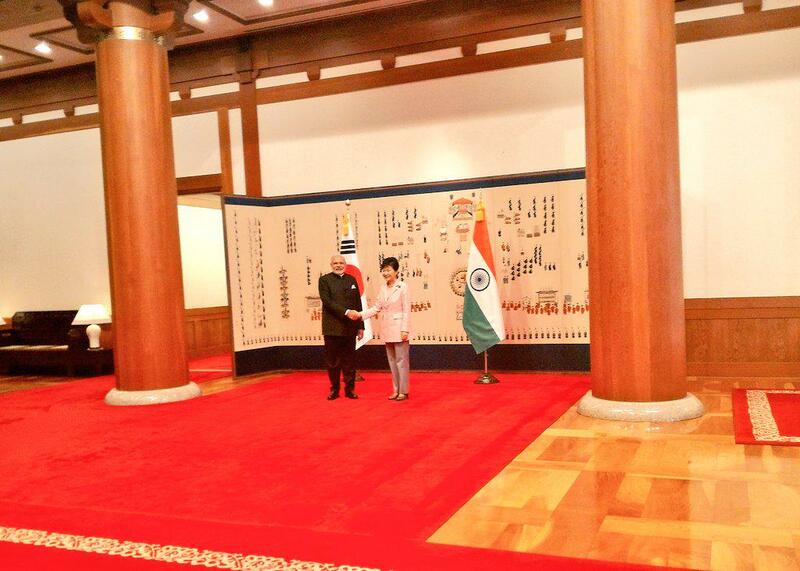 PM @narendramodi and President Park Geun-hye meet in Seoul. Considerable significance is being attached to this visit, the first state visit to be exchanged between India and South Korea since the change of government in India in May last year. Bilateral trade is about USD 16 billion and the two sides are keen to see that it goes up substantially. There are 300 Korean companies which have invested about USD 3 billion in India. They employ about 40,000 workers in India. India's investment in South Korea is close to USD two billion. Indian companies are looking forward to greater access in Korea to pharmaceutical and IT products.